It's summer time, and in a few weeks, Shark Week starts. Every year millions of people sit to watch some of the most dangerous fish in the sea from the privacy of their own homes. However, the famous week is about to get overshadowed by an even bigger threat. The Meg hits theaters a few weeks after the Discovery Channel event and features a 75-foot-long prehistoric shark known as Megalodon, which puts any Great Whites out there to shame. And now, we have two new posters for The Meg to pump up the hype machine. 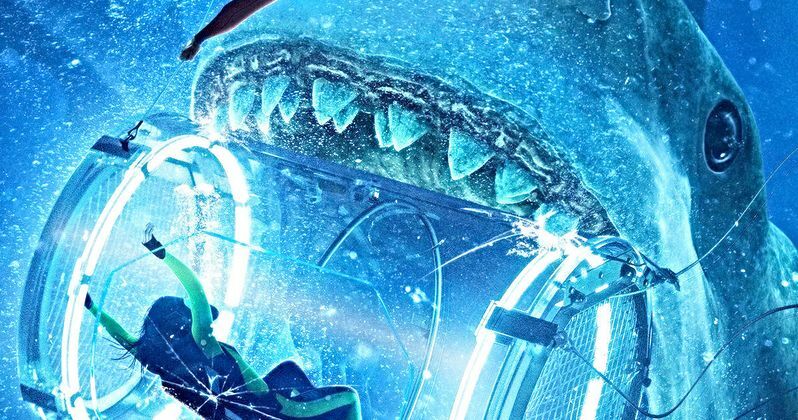 The first new poster for The Meg features the underwater diving tank that has been teased in the promotional material, except this time, the Megalodon is about to take it down as a snack with human filling. Another diver is trying to secure a cable to the tank, but it looks like it's too late. All of the posters for the film have been great, but this one might take the cake as the best one, showing off the immense size of the prehistoric shark while also teasing the thrilling action that will be hitting theaters later this summer. The other new poster from The Meg features star Jason Statham in the water with a tiny spear gun, dangerously close to the Megalodon. There is a major role reversal as Statham goes from hunter to hunted, swimming away from the giant shark. One has to wonder about what Statham's character planned to do with that little spear gun, becasue there's no way that thing was going to take down the Meg. Unless there's some dynamite involved, which could be the case. The Meg has already come under fire for looking like a big budget version of the Sharknado series. That may be the case, but this actually looks good and something that is perfect for the end of summer popcorn movie blues. The whole premise behind the movie is ridiculously awesome and the promotional material has been just as good, blurring the lines between comedy and horror with a 75-foot-long prehistoric shark hunting down humans, treating the ocean like one giant bowl of cereal. The Meg launches into theaters on August 10th, a few weeks after Shark Week, which means it's going to be a lot more like Shark Month this year. In addition, Sharknado 6 will premiere during the week-long event, perfectly setting up The Meg for an explosive shark attack overload. And this is just the beginning. Jason Statham has revealed that if the movie ends up doing well at the box office, we'll get to see a Megalodon franchise, which might just be too much to handle. We'll find out soon enough if a sequel to The Meg is in the cards or not. While we wait, you can check out the two brand-new posters for the underwater thriller below, thanks to Warner Bros.